The original Christ Episcopal Church was built in 1832 on Seville Square overlooking Pensacola Bay. This Norman-Gothic church was badly desecrated by Union Forces during the Civil War who used it as a jail, barracks, a hospital and then toward the end of occupation, as a military chapel. Timeline compiled by Kenneth Karadin, based on an earlier version compiled by The Rev. Dr. B. Madison Currin. 1764: The Bishop of London commissioned The Rev. William Dawson to do mission work in West Florida. Dawson was succeeded in the work by two other Church of England clerics, The Rev. Nathaniel Cotton and The Rev. George Chapman. No church building was constructed during this time. After Florida was returned to Spanish rule in 1781, no Protestant services were allowed. 1821: Florida became a territory of the United States. General Andrew Jackson lived in Pensacola, a city of 1,000, as Territorial Governor. His wife, Rachel, encouraged Protestant missionaries to come to the city. 1827: The General Missionary Society of the Episcopal Church sent The Rev. Ralph Williston to Tallahassee by way of New Orleans. He stopped in Pensacola for three weeks and conducted Episcopal services in an old theatre and the courthouse. He reported that he found 12 communicants of the Church along with 10 Methodists, 2 Presbyterians, and 2 Baptists in a population of 2,000. 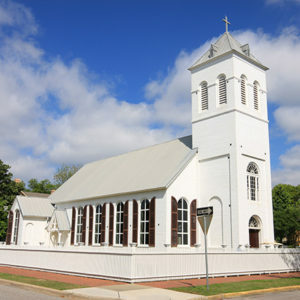 On May 4, 1827, Mr. Williston called a meeting of citizens at the courthouse for the purpose of “embodying and collecting public sentiment upon the subject of establishing a Protestant Church…” The meeting resulted in the establishment of the first Protestant Association in Pensacola, and the Association united to support a Protestant Episcopal Church. Seven vestrymen were elected that day, to lead the first non-Roman Catholic congregation in northwest Florida. 1829: The Legislative Council of the Territory of Florida approved the Incorporation of “Christ’s Church in Pensacola” on October 14. Governor William P. Duval signed the Act of Incorporation two days later on October 16. In Pensacola, a lot was purchased on what is now known as Seville Square. The General Missionary Society sent The Rev. Addison Searle to be in charge of the new parish as the first Rector of Christ Church. He remained only a few months and was succeeded by The Rev. Benjamin Hutchins of Philadelphia, the 2nd Rector. 1830: Construction began on the first church building, which was completed at the cost of $4,500 in 1832. The building was Norman Gothic, rectangular in form, built of brick and plaster. A two-tiered square tower was ornamented with battlements and surmounted by a cross. The organ loft was in the balcony, and the pews had doors. The building had arch-topped neoclassic clear glass windows and a fanlight over the main door. 1833: The Rev. Ashbel Steele of Saybrook, Connecticut was assigned to Christ Church, as 3rd Rector. He developed a ministry at the Navy Yard and with the African Americans. 1836: The Rev. Joseph Saunders of North Carolina, the 4th Rector, succeeded Mr. Steele. Plans were completed for the organization of the Diocese of Florida, and Mr. Saunders presided over the Primary Convention in Tallahassee in 1838. The Rt. Rev. Francis Huger Rutledge was elected first Bishop of Florida in 1851. Judge John Cameron, Vestryman of Christ Church, drafted the Constitution and Canons of the new Diocese. Mr. Saunders reported that Christ Church is a “divinely constituted society, functioning for the benefit of all souls.” Mr. Saunders died of yellow fever in 1839 and was buried under the vestry room of the church. 1838: The Rt. Rev. Jackson Kemper, Missionary Bishop of Indiana and Missouri, consecrated Christ Church on the First Sunday of Lent, March 4, 1838, at 12:00 Noon. This was the first Episcopal visitation to Northwest Florida. 1842: The Rev. Frederick R. Peake became 5th Rector of Christ Church after serving parishes in Missouri. He established the Collegiate Institute in Pensacola, which at the time of his death in 1846 numbered nearly one hundred students. Mr. Peake was also buried under the floor of the church. He was succeeded by his brother, The Rev. Charles Peake, 6th Rector of Christ Church. 1848: The Rev. John Jackson Scott became 7th Rector of Christ Church, a position he held for nearly forty years (except the period from 1853 – 1855, when Dr. Scott served as Chaplain in the U. S. Army in Mobile) and The Rev. David Kerr (8th Rector) and The Rev. David Flower (9th Rector) held the position. Mr. Flower also fell to the ravages of yellow fever and was buried beneath the church. Dr. Scott’s efforts in the area led to the establishment of St. Cyprian’s Church in Pensacola, St. John’s Church in Warrington, and St. Mary’s Church in Milton. Dr. Scott narrowly lost an election that saw The Rt. Rev. John Freeman Young become II Bishop of Florida in 1867. 1866: The families of the parish, and the Rector, returned to Pensacola from exile in Montgomery, Alabama, to rebuild their city, their church, and their lives. 1879: A growing and more prosperous parish expanded its church building, extending the Nave twenty feet to the West, and placing a new tower on the east end. A new organ was put up in the church, and in 1884 stained glass windows were placed in the church by Edward Colgate of New York City. 1889: Dr. Scott retired as Rector, and was given the title “Rector Emeritus.” The altar in the present church is a memorial to Dr. Scott. He was succeeded the next year by The Rev. Percival Whaley, 10th Rector of Christ Church. 1890: St. Katherine’s Church was established as a mission of Christ Church on East Hill. 1897: Development of plans began for the relocation of the Church. Seville Square and nearby neighborhoods, especially Hawkshaw, were becoming extremely undesirable, and many parishioners had moved to newer homes on North Hill and East Hill. In 1899, the Vestry purchased the property at the northwest corner of Palafox and Wright Streets, and in 1902 plans were approved for a Spanish Renaissance building with a seating capacity of 600. John Sutcliffe of Chicago was the architect. 1902: June 4, The Rt. Rev. Edwin Gardiner Weed, III Bishop of Florida, laid the cornerstone for the new church. 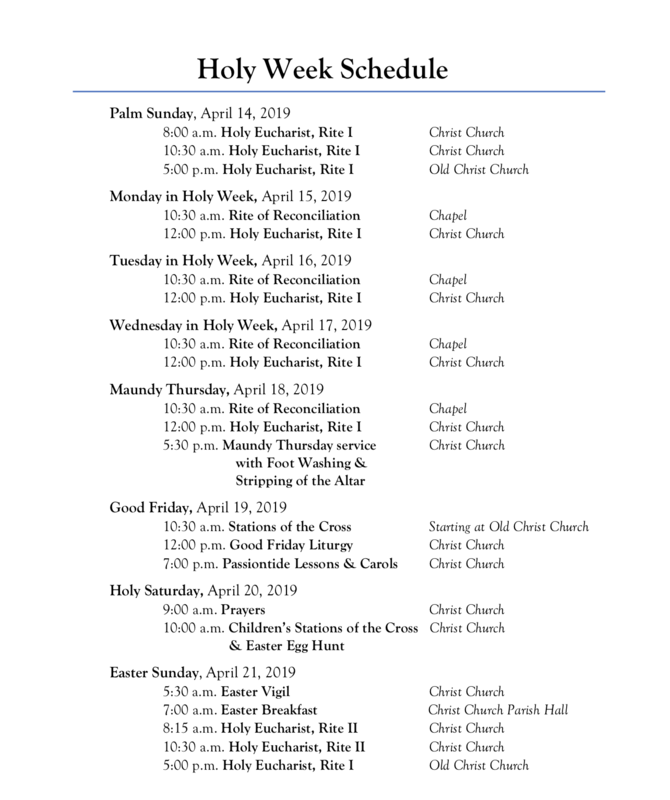 1903: The last service was held in Old Christ Church, Seville Square, on Good Friday, April 10, 1903, at 5:00 in the afternoon. The first service in the new church was held on Easter Day, April 12, 1903, at 7:30 AM, with Bishop Weed present. Old Christ Church served several mission congregations, including Zion Chapel and St. Cyprian’s during the ensuing years. The new building, including furnishings, cost $25,000. 1908: Mr. Whaley resigned and was succeeded in 1909 by The Rev. John H. Brown, 11th Rector. The sanctuary pavement in the church is a memorial to Mr. Whaley, and the altar is a memorial to Dr. Scott. 1917: Bishop Weed consecrated Christ Church on January 14, 1917, the Second Sunday after the Epiphany. 1921: The Rev. George Hendree Harrison became 12th Rector of Christ Church. Under his leadership a Parish Hall was erected, facing Palafox Street, in 1922. Mr. Harrison served until his death in 1936. The bell from the tower of Old Christ Church (cast in 1841) was placed in the new church in his memory. 1934: The Rt. Rev. Frank Alexander Juhan, IV Bishop of Florida, closed St. Katherine’s, citing the need to direct diocesan missionary efforts in more critical areas. 1936: The Rev. Henry Bell Hodgkins began a thirty-year tenure as 13th Rector of Christ Church, which was a period of significant growth and development in the parish. (Dr. Hodgkins left the position for a time during World War II to serve as a Navy chaplain. The Rev. Chas. O. Farrar was 14th Rector for a brief period in 1945.) Also in 1936 Old Christ Church was deconsecrated and deeded to the City. The deed stipulated that the building must be kept in good condition and used only as a museum or a library, or it would revert to the Vestry of Christ Church. Pensacola’s first public library was established in the building. Later it would become the home of the Pensacola Historical Society’s museum and returned to the parish in 1996. 1947: The Chapel of the Beloved Son was consecrated on May 25, Whitsunday, by Bishop Frank A. Juhan. 1951: A large education building was constructed at the corner of Belmont and Palafox Streets, dedicated “That the children of men may become the children of God.” The facility enabled the establishment of the Episcopal Day School the following year. The School is operated by a school board elected by the Vestry and is an integral part of the parish’s structure and life. In 1972, a parishioner’s gift of the old Christian Science Church building on Belmont Street enabled the establishment of a middle school. 1952: Holy Trinity Church in Myrtle Grove was organized and admitted into the Diocese as a mission church. 1956: St. Christopher’s Church in East Hill was established and admitted to the Diocese as a parish, a direct outgrowth of Christ Church. The Rev. Lavan B. Davis, assistant at Christ Church, became the first Rector of St. Christopher’s. St. Francis of Assisi Church in Gulf Breeze was also established at this time. 1957: Christ Church was completely repaired and restored, and the interior was decorated by the firm of Rambusch of New York City. 1966: The Very Rev. Beverly Madison Currin, Dean of the Cathedral Church of St. Luke & St. Paul in Charleston, accepted the call to be 15th Rector of Christ Church, upon the retirement of Dr. Hodgkins. 1969: A new parish house was constructed, to the West of the Church building, and the old parish house on Palafox Street was demolished. The building was dedicated by The Rt. Rev. Hamilton West, V Bishop of Florida. 1970: Christ Church was the site of the primary convention of the new Diocese of the Central Gulf Coast. The Rt. Rev. George Mosley Murray, VII Bishop of the Alabama, became the first Bishop of the Central Gulf Coast. 1975: A fine new pipe organ, given as a thank-offering by Crawford & Betty Rainwater and built by Gabriel Kney of London, Ontario, was erected in the Church and dedicated by Bishop Murray on the Fourth Sunday in Advent. The instrument was the impetus for a series of concerts that was, over the years, to become a major musical outreach program of the parish under the leadership of Kenneth Karadin, church musician. 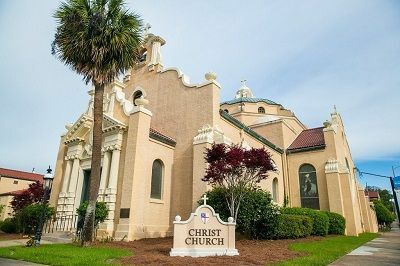 By 1990, annual series of concerts were presented each year under the name “Music at Christ Church,” culminating each June with “ClassicFest,” Pensacola’s summer Chamber music festival. 1979: The Vestry of Christ Church began a more organized and intensive community-outreach program under the name “Stewardship To Others,” which yearly disposes a significant amount of funding from the parish budget to worthwhile community programs and agencies. By 1990, the program had disbursed some $300,000. 1982: Bishop Murray retired as the first Bishop of the Diocese, and was succeeded by The Rt. Rev. Charles Farmer Duvall of Spartanburg, SC, who was consecrated the second Bishop of the Central Gulf Coast at a ceremony April 11 at the Field House of the University of West Florida. 1985: A Columbarium was erected in the Chapel of the Beloved Son for the placement of the remains of deceased parishioners and their families. 1987: After a number of experimental programs in Adult Education, the parish demonstrated its commitment to meeting that need, and to enriching its Christian Education offerings in general, by moving the time of the principal service to accommodate a Christian Education program for all ages meeting at a separate time. 1988: Dr. Judy Bense, on behalf of the Archaeology Department of the University of West Florida and with funding provided by a parish family, conducted an archeological “dig” under Old Christ Church to try to determine the location and condition of the graves of the three priests buried there. The project showed that two graves had been violated, but that the remains of all three were still present. When the project was completed, The Rev. Joseph Saunders, The Rev. Frederick Peake, and The Rev. David Flower were re-interred, according to the burial office of the 1789 Prayer Book, read by Dr. Currin on July 23. 1991: The 20th Annual Convention of the Diocese took place at Christ Church. 1992: Project 21 was launched as a capital funds drive which raised $1,500,000. 1993: Broxton Furniture, across from the Church building on the corner of Palafox and Wright Streets, recently acquired by the Parish, was completely renovated for the home of the Episcopal Day School and named Henderson Hall in Memory of Burney Henderson. 1994: The old Sunday School building, built in 1952, was renovated for use as the Christian Education and Music Center and the Church office building was expanded and renovated as the Administrative Wing. 1996: Old Christ Church on Seville Square, our former home built in 1832, was reclaimed from the city by the Rector and a major fund drive was launched under his leadership to restore the old church to what it was in the 19th century. The title to the property was conveyed to the Old Christ Church Foundation by the Vestry. 1998: The Currin Center, a gymnasium and classroom building on Wright Street across from the parish hall, was completed and dedicated. 1999: Old Christ Church was completely restored at a cost of more than one million dollars raised in a special city-wide fund drive and assisted by a grant from the State of Florida. Later, the vestry conveyed the building to the State with a reverter clause similar to that in the 1936 conveyance to the City. 2001: On Easter Day, the Ascension Mural, located over the main doors of the church, painted by artist Kevin Moss of New York, was dedicated in Memory of Christopher Blair Butler, and given by his parents, William Jack and Patricia Fleming Butler. 2001: Bishop Duvall having announced his intention to retire in 1999, the Diocese went through an extensive search process and elected The Very Rev. Philip Menzies Duncan III, Dean of St. Matthew’s Cathedral in Dallas, as the third Bishop of the Central Gulf Coast. He was consecrated at a ceremony in the Pensacola Civic Center on May 12, 2001. 2002: The Rev. Beverly Madison Currin, announced his retirement as 15th Rector subject to the call of his successor. The Vestry elected The Rev. Dr. Russell Jones Levenson, Rector of the Church of the Ascension in Lafayette, Louisiana, as 16th Rector. Dr. Levenson accepted the call and became rector on November 1, 2002. 2004: Christ Church and the Pensacola area suffered significant damage when Hurricane Ivan made landfall on September 16. The winds pushed the belfry portion of the façade back through the roof, ceiling, and floor of the Nave, with considerable damage to the red tiles on all the parish buildings. Repairs take three years. 2005 & 2007: The Most Rev. and Right Honorable George Carey, the retired 103rd Archbishop of Canterbury, visited the parish, each time confirming a large group of adults and youth. Lord and Lady Carey also attended numerous parish functions. 2007: Dr. Levenson resigned to accept a call to be rector of St. Martin’s Church in Houston, TX. The Vestry elected The Rt. Rev. Bob Gordon Jones, VII Bishop of Wyoming (ret.) and retired president of St. George’s College in Jerusalem, to be interim rector. Bishop Jones served from Autumn, 2007 to Spring, 2008. 2007: The parish acquired the property (known as “The Dennison Property”) south of the Episcopal Day School on Palafox Street. 2008: The Vestry elected The Rev. Charles Neal Goldsborough, rector of St. John’s Church in Barrington, RI, and a chaplain in the U.S. Navy, retired, to be the 17th rector of Christ Church. 2009: The Most Rev. Katharine Jefferis Schori, (a native of Pensacola) the XXVI Presiding Bishop of the Episcopal Church, visited Christ Church on May 29, celebrating the Eucharist and preaching. 2009: The parish purchased the former St. Michael Catholic School property and the Episcopal Day School developed it into an Early Learning Center (ELC), which opened in August 2010. In 2013, the campus was named the Hilton-Green Campus, honoring the memory of a generous supporter of Christ Church and EDS, Henry Hilton-Green, Jr.
2015: On the retirement of Bishop Duncan, the Rt. Rev. James Russell Kendrick, Rector of St. Stephen’s Church in Birmingham, AL, and a native son of the Diocese, was elected and consecrated fourth Bishop of the Diocese of the Central Gulf Coast, on July 25 in the Expo Hall of the Mobile Civic Center. 2015: Fr. Goldsborough announced his retirement effective in November. The Vestry elected the Rev. David Knight, interim Rector of St. Paul’s Church in Deland, FL, in December. He was succeeded by The Rev. Robert Blackwell, retired rector of Grace Church in Cullman, AL, in July 2016. 2016: The Vestry elected The Rev. Michael Patrick Hoffman, Rector of St. Peter’s Church in McKinney, TX, to be the 18th Rector of Christ Church. Fr. Michael began his ministry on the Second Sunday of Advent.